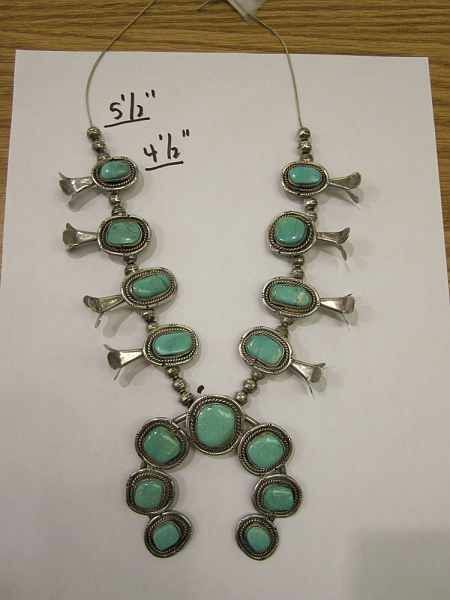 An old squash blossom necklace arrived in an estate lot here at the store but it had some damage issues. One squash blossom was missing altogether. And the bead wire had broken near the naja and there were some loose beads in the box. So I adopted it and decided to make it more wearable for me. I’m not much for big, long, heavy necklaces where the pendant portion hangs right across the female bosom, no, I’m more of a choker kind of gal, so I thought this would be a perfect modification for my go-to repair gal Diane Radeke. 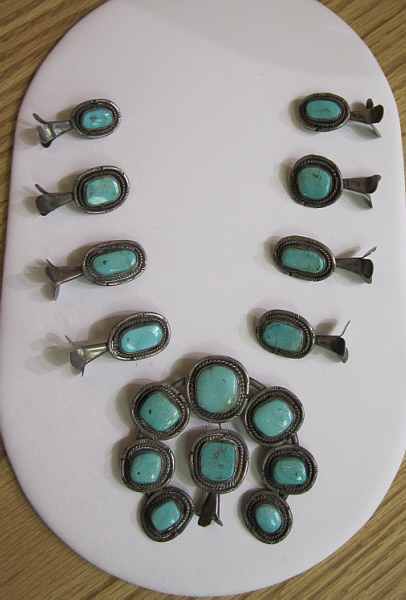 Diane shepherds repair projects from the customer to her Native American silversmith partners with such care and professionalism that I e-mailed her for help. Here is her contact information and our correspondence. 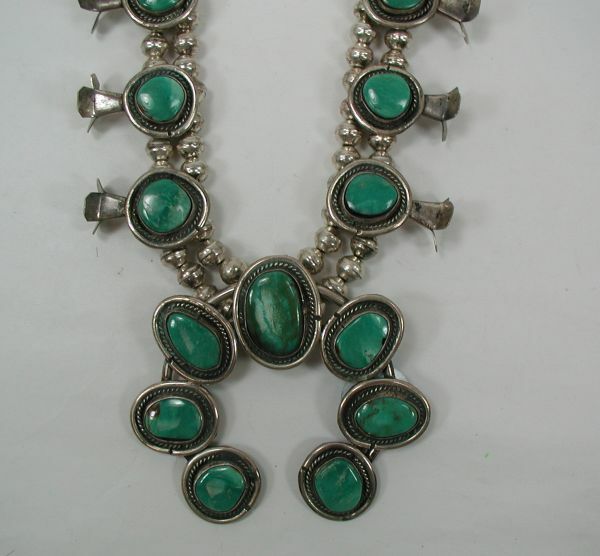 I’d like one squash blossom removed and the necklace shortened and restrung. It looks like currently it measures about 23-24 inches on the inside (is that what you get?) and I’d prefer an ending length of 20-22 inches on the inside. Is that doable? There are 131 beads total including the 4 loose ones in the small zip lock bag. Will that be enough? I’ve put a piece of tape on the squash blossom that I’d like removed. It has a goofed up squash blossom end and has the stone I like the least, so let’s remove that one. I think the remaining pair will match up just fine. You had suggested making the extra squash blossom into a ring. That’s a great idea but I don’t picture me wearing a ring like that. So I’ll just hold onto it along with the extra beads for a rainy day! Also please don’t polish or buff this piece. The squash arrived. I got an inside measurement of 25 ¼”. I measured the beads end to end at the top row of beads, so my measurement didn’t include the naja. When I tried on the squash and pulled it up to where I would wear it, I figured on pulling off 7 beads from each side, for a total of 3 ¾” overall shorter (21 ½”). So I think we’re about in the same ballpark, but I have no idea if we are similar height and weight, and that makes a difference. What we can do here is to restring it, leaving the end wires long, then I can get a much more accurate idea of how to suggest fitting this properly. For the necklace, I’m 5’7” average build. I’d probably wear this over a blouse or sweater or shirt, sometimes under a collar so I think we are in the same ballpark at around 21 1/2”. If I want to wear it longer, I have extender chains here I can use, but I rarely wear a necklace too far down on my chest because I am, as my hubby says, well endowed ! Build-wise, we are similar. I’m 5’8”, slender and not-so-well endowed. 21 ½” would probably be the very shortest you would want for your squash. I’m guessing we’ll have about 11 beads left after restringing to that length, which would be enough for an almost 4” extender. We could string the leftover beads and add a hook and eye; you’d have a matching extender for those days when you’d want to wear over a collar. Sound good? Let me know. I’ll still stop before the ends are attached and we can double check the length. Regarding the blossom pieces, I can see now how one could have gotten lost. The wires attached to the back that connect the blossoms to the string of beads are not soldered on very solidly. The solder joint is what broke on the piece that was lost – the wire is still on the beads. Henry has checked all of the other joints and has found 3 that are pretty “iffy”. He can cold-solder those when the piece is disassembled. That technique will not require any buffing, but it will give a better grip so you won’t have to worry about losing another blossom in the future. Also regarding the blossom pieces, some of the “petals” have been bent into kind of irregular positions, resulting in a “not as pretty as it could be” appearance. I’m a big fan of handcrafted and funky, but these are bordering on looking like they got a little squished. Do you want the guys to ever-so-slightly tweak some of those into a more uniform appearance? If you’ve got your pics, I’m looking at the petals on the top left (as you’re wearing it) side being bent in 3 different directions and the petals on the second from the top right side being kind of squished with a bit of a dent, as a couple of examples. I’m not thinking much, just a bit of fine-tuning to bring it back a bit closer to the way the artist probably made it originally. Your choice entirely. Let me know. While the piece is disassembled, we’d like to wash the naja and blossoms. As you are definitely in favor of original patina, I want to explain this and get your approval first. This is one of my “soap box” issues, so bear with me! You may or may not be aware of all the techniques we can use on the surface of silver. I meet many, many people who do not want the surface of their silver touched in any way, not even to be cleaned. To me, there is a big difference in being “cleaned”, being “polished”, and being “buffed”. It’s mostly semantics, but I think there is a lot of confusion about what might be the best way to treat a piece of jewelry. To me, buffing is something done with a buffing machine, in the shop. Buffing actually smooths the surface of the silver, and removes all those tiny fine lines and scratches that create the soft, beautiful look of a well worn piece. With very few exceptions, I don’t like to see anything buffed. The exceptions would be for pieces that are very contemporary or have a very bad scratch that detracts from the piece. Some people like their pieces buffed, regardless of the age or history of the piece. The tiny fine lines and scratches can be replicated by buffing the surface with steel wool, but a trained eye will spot it every time. It can look nice, but it’s not “patina”… If a piece must be hot soldered for a repair, it must go through the buffing process – no way around it. Our guys are awesome, but that is one of their biggest challenges – hot soldering on a vintage piece and retaining the “look”. Conversely, to me, polishing is using a chemical agent to clean the blackened tarnish from a piece of silver. Polishing (in my phraseology) doesn’t remove the scratches at all, but it can remove the oxidation that may have been applied to enhance the design of a piece. Oxidation can be very successfully reapplied (chemically) BUT most polishes will leave nasty residues in all the lovely details of this beautiful handmade stuff. The residue turns white or green or pink…One of the few chemical “polishers” that doesn’t leave a residue (Tarnax) will actually dissolve turquoise and coral, among other things. Can’t tell you how many Tarnax victims we’ve repaired here. Polishing with any of this chemical stuff is really intended only for flatter manufactured pieces, like silverware, and even then, just cleaning it will frequently work better. So, regarding my favorite and most suggested technique – cleaning; a good washing (done properly, of course) will remove all the gunk, label residue, polish residue, grime, dust, cookie dough (yeah, we’ve cleaned that…) and any other surface stuff that “shouldn’t be there”. The result is a piece that still has all the fine scratches, oxidation, and beauty (the “patina”) of an old piece, but it will show with a beautiful true silver glow, instead of a flat yellow gray appearance. In my opinion, it really enhances the piece. Your squash has polish residue (a lot), label residue, and quite a bit of surface “black stuff” that I can scratch off with my fingernail. Its general surface appearance is somewhat flat and dull. These aren’t doing this squash any justice. If we clean it, the detail will be much clearer, and the silver will have a bit of a shinier glow, but it will NOT shine like a piece that’s been buffed. In summary (thank goodness, you’re probably thinking! ), I recommend washing this. We don’t wash beads, because they’re too hard to dry out properly. We would wipe them with a cotton glove only. The blossoms and naja would be washed while unstrung. I can “kind of” clean it if you’re more comfortable with that, i.e. get the green polish residues out but not go crazy over every bit of dinge… Let me know. No problem if you’d rather we didn’t. You a treasure. I love all the detailed information from behind the scenes at the repair shop ! I’d LOVE an extender to match that I could wear on my longer days !! Brilliant. And yes to the wash. Yes, I’ve seen those little dangly stones in the najas and in fact just got one in this week with almost a little teardrop dangly…….but this one is too large and makes the naja look crowded and more like a cluster rather than a naja – I prefer the pure open circular naja shape, so I’d say leave it out. We’re coming down the home stretch on your repair. Everything is looking really good! The outer row of your squash is strung. This is the time to adjust the length, and we need your input. The original blossoms were separated by 4 beads each, but since there are only 4 blossoms on each side now, we thought we’d restring one side of it with 5 beads between, just to see how that looks. I’m sending a picture where one side is shorter and one is longer. The picture alone is not a good example – you’ll have to imagine how this will look when it’s on you. When I tried the squash on at 21 1/2 inches, the “5 bead” side wound up with the top blossom just slightly too high on my collarbone. “Just slightly” means 2 of us thought it was okay and one of us thought it was too high. A solution for that would be to make the total length a tad longer, to drop that top blossom to the collarbone. The “4 bead” side had the top blossom just below the collarbone, but it wound up looking too condensed toward the naja – as if something were missing at the top. A solution there would be to make the total length shorter, but I really don’t think that will work, given your body type. It’d wind up looking like a choker, and I bet you’d always be using the extender. spare beads here, so that needn’t be of concern. I measured from the dot inside the naja up to the lines. The top measurements are where the outer row of beads will connect back into the inner row; the inner row (when it’s added) will continue up around for total length. Ideally (to us) the blossom should not be above the collarbone, and the 2 rows should merge where that merger can be seen from the front (not behind your neck). You are so thorough. What a joy to work with you !! I did the measuring homework on my necklace. We happened to get one in last week in an estate lot that is exactly the same dimensions of the squash you are working on, so it it was great to use as a tester. This necklace had 5 blossoms on each side with 4 beads between, same size stones, same type blossom ends, same size naja !! I put on the mock neck that I usually wear with this type of necklace, fastened the test necklace at the length I would like and modeled in front of a mirror and for hubby, imagining the top blossoms missing…………and then I measured end to end on the inside to where I had fastened it and came up with 21 1/2″ as the perfect length. With the extender you said you could make, it will allow me to also wear it over the top of a velvet collared button shirt which I also use when the weather gets chillier. So I would ask for 4 beads between each blossom and 21 1/2″ total inner length. The one thing that I would like different, and I hope I can describe this well with words. The beads between the naja and the first blossom. It looks like from the photo you sent me, there is one LESS bead in the outer row than there is on the necklace I am using as a tester here (see photo) and I like the extra bead this tester necklace has in the photo below. I think it sets off the naja better with a bit more space between it and the first blossom. And since what you sent me is the OUTER row, it should be a tad longer there anyway……..hope I make myself clear. After you compare the photo you sent of the one you are restringing with this one below, it looks to me like the necklace you are working on shows 2 beads between the naja and first blossom and this tester one shows 3. I like 3. As far as actual beads present between the naja and first blossom, on this tester necklace there are 6 in the outer strand and 4 in the inner strand. How many are there on the one you are restringing? I know it is hard to guess how many were there originally as I look at photos of the back of it that I took before I sent it in because that is where it was broken and there were beads missing. But it looks like there were supposed to be 6 on the outer and 4 on the inner. Let me know if you understood and how this all will work OK? How fortunate to have a necklace to use for a model! It makes a world of difference for measuring. I’ve got your squash in front of me. We’ll put 4 beads between each blossom, as they were originally strung. From the first blossom to the naja will be 6 beads, instead of 5, on the outer row. There were 5 originally (we Xerox these things before we unstring them!). 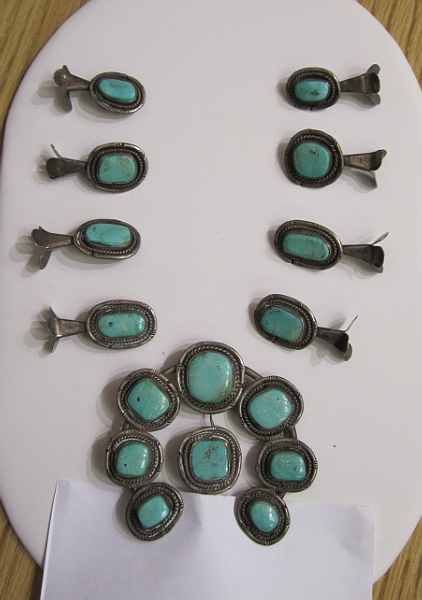 We’ll put probably 5 beads on the inner row – whatever it takes to make the naja hang straight. I’ll photograph and measure one more time before the loops are soldered to the ends so you can double check. Then we’ll add the inner row to measure 21 1/2 inches. We’ll use the leftover beads for an extender. We didn’t go super crazy with the cleaning, just enough to be clean and have an aged glow. There are still dark parts on the beads and blossoms, but it’s not a dingy look. If you want it to be cleaner, let me know. We could get all the black off of the beads without bench polishing, but I’m pretty sure that’s not the look you were hoping for. The way it is now makes it look like a vintage necklace. Again, let me know when you see the photo. Yes leave the wabi sabi cracked stone as is. I’ll watch for the photo !! Here’s the result with the adjusted bead counts. 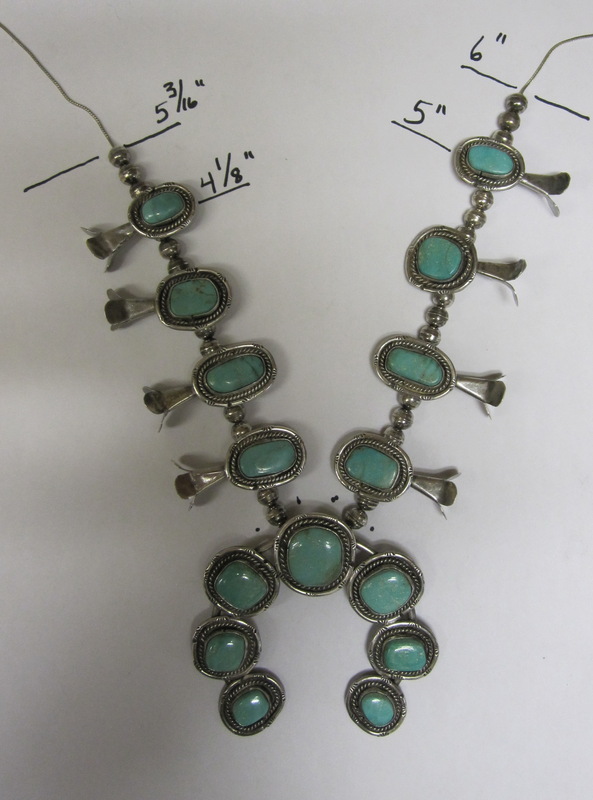 I think adding the extra beads at the naja was a good call – it got rid of the “squished” look we were seeing before. How does it look to you? Should we string it up? What a fascinating article! I learned a lot while enjoying the back and forth conversations to get the necklace exactly right. Thank you for sharing this great information. What dedication! I’m impressed with the thoroughness. Can you give me an idea of what she charged you for the cleaning and restringing? I am hoping to do something very similar. I don’t remember, the best suggestion is to contact Diane at the email address in the article. I love this – thank you for sharing. I wondered if either of you would have any ideas why a squash blossom necklace would be missing the entire inside row of pearls? I’m guessing either they broke or were taken off to sell as separate? Thoughts would be great – many thanks.